The pattern for this quilt comes from the Better Homes and Gardens Quilts and More Spring 2009 magazine. The inspiration for the quilt came from this rainbow Riley Blake fabric pictured below - I loved the use of the dark blue in the print and thought that adding an element of "gray clouds" to the whole thing would be fun. 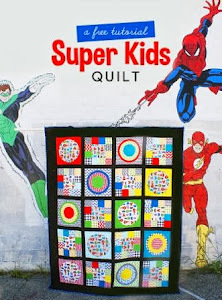 Like a lot of quilters in blogland lately, I have been using Angela Walter's new book to try out some new free motion quilting designs. I think I like the paisley and woodgrain the best so far. I attempted a different design in each log cabin strip, some more successfully than others. I used some AH "Love American Style" fabric that had been in my stash for ages, I am pretty sure the selvedge said "2006." I bound it in an Erin McMorris Urban Garden purple print. I am entering this quilt into the 2012 Blogger's Quilt Festival. I also did a quick and dirty planet applique on her shirt. I couldn't believe that some people guessed that she was Kermit the Frog. Really? Three eyes? What type of Muppet movies were they watching? Next year, she will probably be a pumpkin - a favorite standby costume option that Gregory wore as a toddler. Happy Halloween! On Monday of this week, the stars aligned and both of my children took a 3.5+ hour nap at the same time. I quickly got started on putting all of my Crackle blocks together to make this quilt top. I love how it came out! This is such a fun, easy pattern. 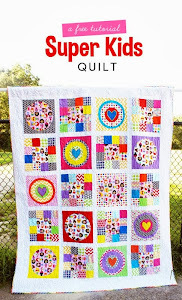 The only thing that bugs me is that I am just not a big fan of precuts- I much prefer the look of mixing collections together to create a quilt. Next time, I think I might make my own layer cake from my stash. The pattern is "Crackle" by Aneela Hooey, available in her etsy shop. The fabric line I used is called Lucy's Crab Shack. It may be a little while before I finish this one because I don't think I have any stash options for backing. If anyone knows of a great price on this fabric line - please let me know. For the time being, this quilt top joins the other projects in my WIP pile. I recently gathered all of my WIPs to take a picture for a post on the BMQG blog regarding the guild challenge to have members complete their WIPs (as well as start to use their "precious" hoarded fabrics that we are all afraid to cut into). Turns out I have 10 WIPs (I found another one after I took this picture). Some are more important to me to finish than others.... but it's certainly more of a priority for me to get going on these after seeing them all together in such a big pile. I know it's been quiet on this blog but I have acutally finished a queen sized quilt that won't be revealed online until next summer. But in the meantime, I am nearly done with the AMH Dreamweaver quilt top. My search for a linen/cotton blend for sashing was finally resolved yesterday when I finally found some at the Cambridge Quilt Shop - the fourth local store I had tried! I will post pictures as soon as it is completed. After a long ordeal trying to use a gift card on Barnes and Noble.com, I finally have a copy of Aneela's first book: Little Stitches. The book is just darling and I can't wait to get stitching! I am doing a little destashing on my etsy shop - time to unload a few stacks of fabric that just aren't being used. I decided to change my blog name after I attend this weekend's BMQG meeting - the topic we will be discussing is "blogging" and I am eager to get some advice/information that other members may have on the subject. I made this rainbow log cabin lap quilt last weekend. I used a pattern from a quilting magazine - I will cite the source when it's all finished. I am surprised this is the first rainbow-quilt I have made, as I definitely love lots and lots of color. I am please with how it came out - the grey is symbolic of clouds and sky. I finally made a serious dent in my Anna Maria Horner stash to make a quilt for the Tula Pink Sew Along. I am using a pattern from her book called Dream Weaver. Occasionally, on this blog, I like to share thrifty finds from yard sales that relate to sewing. Since Charlotte was born early this year I haven't been yard saling as often as I would like. But there are still a few weekends left in the season and I plan to take advantage of them! On Saturday, I bought this gorgeous handmade, never been used pillowcases for a dollar a piece! You can't buy cheap, plain ones at the store for that price. I also couldn't resist this antique-looking toy crib to give to Charlotte someday. (It was only $3, so I really doubt it was anything special). Can you imagine the cuteness of placing a Wee Wonderfuls-like doll along with a sweet doll quilt in there!? I am so happy I had a little girl!